To all who have sagaciously picked up on Atterberg�s opulent nationalism this disc will be an indispensable addition to the shelves. CPO have already cornered the Atterberg market with a complete set of the nine symphonies at bargain price. When I reviewed that set I pleaded for his String Symphony to be recorded and here it is conducted by Ulf Wallin. The Sinfonia per archi (Symphony for Strings) is a latish work from this long-lived composer. It derives from his String Quintet. What a reactionary work this must have seemed when premiered in the 1950s. The style is approximately between Sibelius's Sixth Symphony, Tchaikovsky's Serenade and Frank Bridge's Suite for Strings. It is a luxuriously romantic piece across four movements. Camerata Nordica are recorded in a lively almost unruly acoustic which allows a gritty, guttural excitement to be caught alongside the sentimental whispers and half-lights. 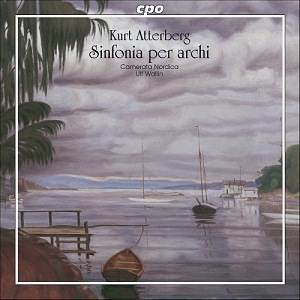 Surely Atterberg was influenced by Wirén's Serenade for Strings in the second movement allegro molto and elsewhere. The influence of Sibelius returns in the lovely tranquillo which combines the watercolour delicacy of Sibelius's Tempest and a sentimental melodic invention we may now associate with John Barry. The finale floats and darts along a middle way between Tippett's Concerto for Double String Orchestra and Holst's St Paul�s and Brook Green suites. The piece ends in fragile twilight: a pizzicato figure and a quietly held sigh. Almost incredibly the Adagio Amoroso for violin and strings dates from 1967, his last work. It is melancholic; sensitive rather than ardent or passionate - recalling Sibelius's two serenades and Laetare anima mea. The three movement Intermezzo has the air of Elgar's Pomp and Circumstance march trios and of Korngold's triumphal music in The Adventures of Robin Hood - muscular and noble. The end of the first movement resonates with the hoarse attack of Elgar's Introduction and Allegro. The central adagio is sentimental. The title of the Prelude and Fugue suggests dry academicism. Not a bit of it. This diptych was originally for organ in 1917 and was then arranged for strings in 1933. The language is rich with allusion. This is much closer to the Sinfonia than to the Intermezzo. If the Sinfonia has the scale and weight of say Elgar�s Introduction and Allegro then the Intermezzo is the equivalent of the Elgar Serenade. Atterberg wrote the Suite No. 7 in 1926, drawing on music he had written for a stage production of Shakespeare's Antony and Cleopatra. The five movements are splendidly romantic with gleaming strings; how Stokowski would have revelled in this! The music suggests Grieg's Gynt. The final Festivo flies along, again linking in style with Holst's Brook Green - bluff and celebratory - just like the opening alla marcia. Not to be missed by Swedish romantics. Beautiful coaxed and balanced dynamics, subtle and diaphanous textures contrast with resinous attack.